Besides getting some R & R, the summer time is often planning time for many teachers. 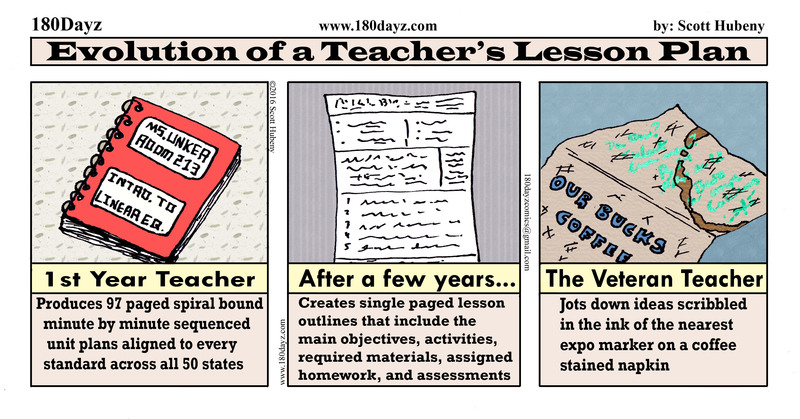 So while you’re cracking open those curriculum books at the beach and planning your school year, enjoy this cartoon that takes one through how a teacher’s lesson plan evolves over their career. On a side note, the printing process is complete for the 2016-2017 180 Dayz School Year Calendar, so look for some more information on how you can get your own copy soon. Take care and continue to enjoy your break.